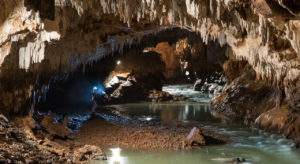 Each entry in the result file corresponds to a single cave with some indications of how they connect in terms of entrances, exits, and intermediate tunnels. Move on to the next cave entry in the list and start the process again. Note: Since players will backtrack on occassion, be sure to make a note of which entries connect and how (this will obviously be easier if you print out your list). That’s all there is to it! Good adventuring, and let me know if you have any feedback.